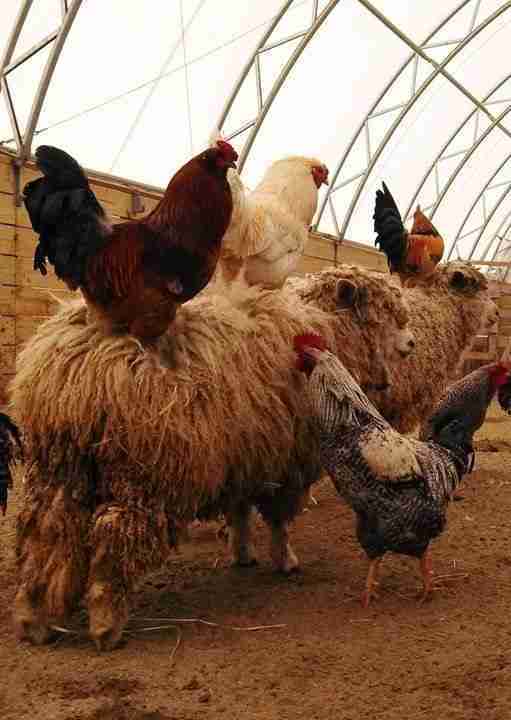 One Rooster's Snow-Day Solution:Take the Sheep Train! By Pattrice Jones Matisse came to VINE sanctuary as a juvenile this past spring after being evicted from a homeless encampment. He's a semi-feral bird who normally spends all day in a wooded area near the pigeon aviary, coming inside to sleep only at the last minute before dark. Matisse encountered snow for the first time this winter and was not happy to make its acquaintance. While I always hesitate to say that I know what another animal is feeling, I feel safe in saying that Matisse hates snow. 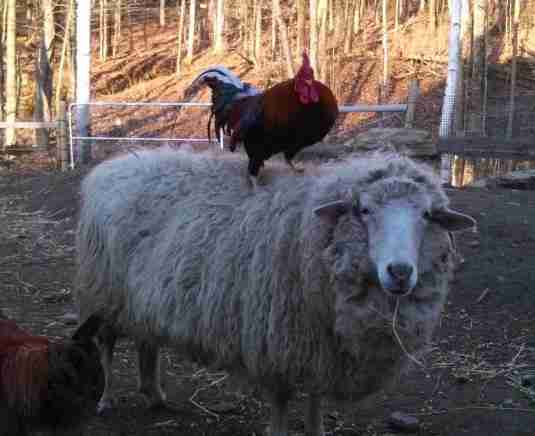 But he hates being cooped up even more, and so we see him, almost every day, hitching a ride on somebody's wooly back. Today, I looked out my window early in the morning, just in time to see the ewe called Lemon arriving at the hay ring with Matisse perched on her back. The hay ring is in the middle of the pasture, quite a distance from the barn, but he had evidently ridden all the way. I would soon see how he managed that. As Lemon munched her breakfast hay, Matisse hopped off and scratched the ground for seeds. After Lemon had her fill, she turned to go-and then waited for Matisse to hop on! She then walked very slowly down a slight slope. Sheep bound easily up and down rocky hillsides. There was no need for Lemon to step so slowly and carefully, except that Matisse was perched on her back. Each time the rooster lost his balance and began to flap his wings, Lemon stopped and waited until he was settled again before taking another careful step. In this way, they proceeded to the cleared driveway, where they took a break, and then on toward the pigeon aviary. VINE Sanctuary started when two people drove past a chicken in a ditch and made the snap decision to stop and at least try to offer care to this unfamiliar animal. In the 14 years since, the sanctuary has been the scene of so many episodes of interspecies cooperation and care. These days, a gaggle of peace-keeping geese help us with the project of rehabilitating former fighting roosters. A cow called Buddy makes it his business to welcome every newcomer, regardless of species. The 3,000-pound cow called Thunder once used his huge forehead to gently nudge newly-arrived young turkeys into the coop where they could nest, feather to feather, with the rest of our truly motley crew. As Peter Kropotkin showed in his classic 1902 book by that name, Mutual Aid among animals of different species is commonplace. On the internet, stories of trans-species adoptions or other instances of one kind of nonhuman animal helping another always circulate widely. Such stories seem wondrous to us because we've been taught to be selfish and told that competition rather than cooperation is the norm in nature. We've also been taught to see animals as passive objects of human attention rather than as active participants in problem-solving. 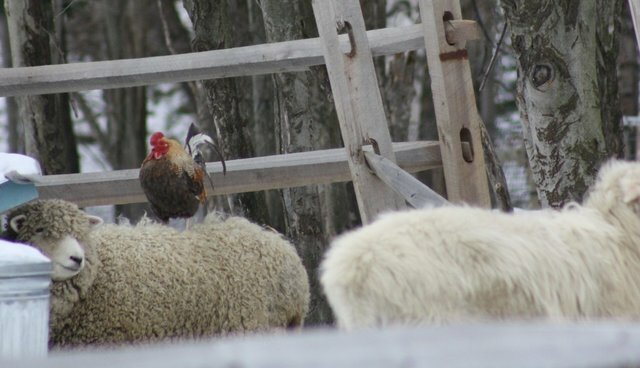 Sheep tend to be particularly persistent problem-solvers, creatively trying different strategies until they figure out how to get where they are trying to go. And they are anything but "sheepish" when it comes to vocally expressing their wishes. 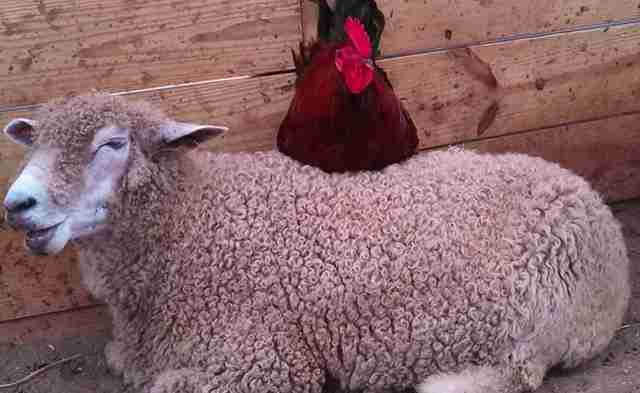 I can't know what thought feels like to a sheep, much less what Lemon was thinking this morning. But I do know that she deliberately helped Matisse solve the problem of the snowy pasture, taking time out of her day to do so. She could have run to join the other sheep scrounging for spilled birdseed by the pigeon aviary, but instead she stepped slowly, stopping each time Matisse needed to regain his balance on her wooly back. Such moments always remind me that we are not the rescuers of animals but, rather, allies in a mutual project of care-giving.